Size of Male: 15-18 lbs., 14-15.5 in. Size of Female: 13-18 lbs., 13-15 in. The Smooth Coated Fox Terrier, or Smooth Fox Terrier, is an active, friendly, playful dog. They are well-known in fox hunting and dog show circles though probably not as well-known to the general public. They were the first of the fox terriers to be recognized by the kennel cubs in 1875. The Smooth Fox Terrier makes an excellent family pet. They are intelligent dogs and very affectionate to their owners. However, they do have strong hunting instincts and may chase small animals. They can also become diggers if left with nothing to do. The Smooth Coated Fox Terrier is said to date back to the 17th century. The dogs were kept by farmers who needed terriers to help them get rid of vermin. Fox Terriers were also used to drive fox and other quarry out of their dens. This dog breed became popular for use during fox hunting to drive foxes from their hiding places. It’s believed that the Smooth Fox Terrier was created by crossing the Old English Terrier, smooth coated Black and Tan terriers, Bull Terriers, Greyhound dogs and Beagles. At one time, the Smooth Coated Fox Terrier and the Wire Fox Terrier were considered the same breed with two varieties, but the two breeds have been separated in the United States since 1985. The two breeds are believed to have had different origins but there was interbreeding at one time. The interbreeding was discontinued many years before the breeds were separated. 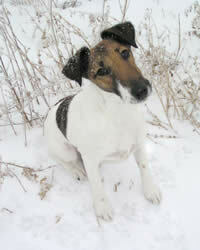 The Smooth Fox Terrier was used in the creation of a number of other fox terrier breeds. The Smooth Fox Terrier is a friendly and playful dog. Dog training is generally easy and they make very good family pets. They usually get along very well with children and they are considered bold but not aggressive toward people. They make fine watchdogs. As terriers, these dogs do have a very strong desire to dig so you will need to protect your yard and garden from them. They can also be escape artists, especially if they can find a way to dig under a fence. These dogs will chase other small animals, including family pets, so they need to be carefully introduced to other pets at a young age. Living Environment – The Smooth Coated Fox Terrier is a very active dog, indoors or outdoors. They can be kept as apartment dogs but they do require plenty of exercise. Grooming – This dog breed has a short, sleek coat and grooming is easy. They should be brushed regularly to reduce shedding. Bathe occasionally. Diet & Exercise – Dietary needs for this breed are considered normal. They are very active dogs, they do require regular daily exercise and they enjoy having a yard of their own. They can also do well if you take them to places where they can safely run off-leash. However, be sure they cannot escape since they can take off on a joy run. They are also prone to chasing after small animals if given the opportunity. They may hunt and kill these animals. Health – The Smooth Fox Terrier is generally a healthy breed. However, they can be prone to deafness, luxating patellas (slipped kneecaps), and several dog eye problems such as lens luxation, distichiasis, and cataracts. Legge-Perthes disease, Myasthenia Gravis, idiopathic epilepsy and goiter can also occur in the breed. Some of these problems can be quite rare. If you are interested in this dog breed, you should talk to a breeder about possible dog health problems. In the dog training department, Smooth Coated Fox Terriers are said to be very intelligent dogs and are considered to be highly trainable. They can excel at obedience, agility and other dog activities. These small dogs are very quick and agile and enjoy doing things with their owners. As with most dogs, they respond very well to positive dog training (praise, rewards).